You know how I’m always trying to relate aviation and weave it into my every day lift? It’s been such a bummer being not able to fly with this event going on so I’m trying 10 times harder now. Even after working about 10 hours each day and waking up at 4:30am or 5:30am I’ve been motivated to run! (See Goals 2013, I’m on Week 5 now of Couch to 5k) I go running after work, and of course, I always pass the planes at the high school, just for some eye candy. Halfway through my workout I get to run by JetBlue headquarters. 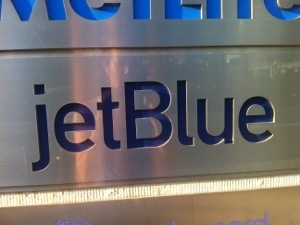 I love riding the train home at night and see a big JetBlue sign lit up on the building. I bet their offices are pretty cool. I’m pushing it for aviation topics, but cut me some slack. I even noticed when I was at the last part of my run (getting tired but had another minute left) I wanted to not look down at the ground and be tired, I noticed I automatically said “Look down the runway” because I was switching my vision from down at the ground to the end of the block. Oops. I’m taking advantage of the next three days my boyfriend is home to do some studying about VORs and Flight Planning to hop ahead and be optimistic about my next batch of lessons. Fingers crossed as always.